Newcomer Family Obituaries - Father Leo Schloemer 1925 - 2019 - Newcomer Cremations, Funerals & Receptions. 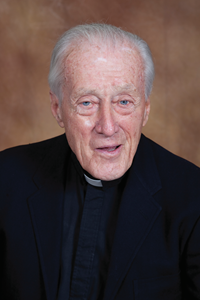 CINCINNATI — Father Leo Bernard Schloemer, 94, a Glenmary Home Missioner for 67 years, died March 25 in Cincinnati, Ohio. Father Leo's spent his first decade in traditional Glenmary missions before embarking on a unique experiment. From 1969-1975 and again from 1987-1991, Father Leo served in Colombia. He was the founding pastor of San Simon Apostol and Maria Madre de Dios parishes in the Archdiocese of Bogota. He served as the Bogota archdiocese director of vocations and worked to establish other Catholic communities. He worked with the Colombian bishops to establish their own home mission society, modeled after Glenmary. He was the first Glenmarian to study Spanish to communicate with his parishioners in Colombia. Now, many Glenmary missioners speak Spanish. A native of Cincinnati, Ohio, Father Leo made his first oath with Glenmary on Aug. 15, 1952. He was ordained a priest on May 20, 1956. Father Leo’s service to Glenmary included assignments in Ohio, Oklahoma, Texas, Arkansas and beyond. He studied internationally at the University of Louvain in Belgium where he earned a master’s in theology. Father Leo served as Glenmary’s Director of Education from 1979 to 1983. Father Leo first felt the call to become a priest during World War II. He served in the U.S. Navy, and in 1945, his ship, the destroyer USS Renshaw, was torpedoed, killing several shipmates. “It makes you take stock of your life, of what’s important and what you want to do with your life. You consider a lot of things you’ve never really taken the time to before,” Father Leo said of the incident. For him, the deficit of churches and priests in the South were motivating factors in joining Glenmary. Growing up, he met children who moved to his hometown who knew little to nothing about the Catholic Church. He wanted to bring awareness and education about Catholicism throughout the United States. The oldest of two children to Leo B. and Mary (Butler) Schloemer, Father Leo is preceded in death by his brother Paul Schloemer. Reception of the body will take place Wednesday, April 3 at 4:30 p.m. at Our Lady of the Fields Chapel, 4085 Glenmary Trace, Fairfield, Ohio. Visitation will follow. A wake service will begin at 7 p.m.
Mass of Christian Burial will be at 10 a.m. Thursday, April 4 at St. Matthias Catholic Church, 1050 W. Kemper Road, Cincinnati, Ohio. Memorials may be made to Glenmary Home Missioners, P.O. Box 465618, Cincinnati, OH 45246-5618. Newcomer Funeral Home is assisting with arrangements. Add your memories to the guest book of Father Leo Schloemer.